A volatile year so far for European equities hasn’t put a stop to the region’s fundamental equity drivers and each of the 4Factors on which we analyse stocks are showing encouraging signs for the region. This gives us confidence that our bottom up process can deliver regardless of recent headline news. As we approach the middle of the year, with sluggish stockmarket returns so far in 2018, it makes sense to assess where we are with regard to the investment case for European equities. The first quarter earnings season is now over and whilst companies have beaten expectations on average, we have seen some moderation. We ascribe a large part of this slowing momentum to FX headwinds; given that the euro strengthened 15% yoy in the first quarter vs the dollar and 8% on a trade-weighted basis. Interestingly, companies are still beating revenue expectations on the whole while margins are also surprising positively; showing that the recovery story remains on track in spite of the stronger euro. Investor sentiment has also been tempered by softer macro data such as recent GDP and PMI releases. However, this isn’t surprising given the pace these numbers were running at in the closing months of last year. Indeed PMI figures were at the top end of historic ranges, so some amount of mean reversion was to be expected. As ever, political risk remains – especially in Italy, which just succumbed to the charms of populist government. We believe that high public debt levels and coalition politics will continue to restrict meaningful change within Europe; though we expect the former to ease somewhat given the pace of recent economic momentum. Despite this recent moderation, we believe the current environment still offers plenty of scope to continue the strategy that has served our investors so well in recent years: finding areas of the market where earnings recovery is evidenced but not yet priced in. What does Europe currently look like? Before diving into the details, let’s remind ourselves of the characteristics we screen for at a stock level: earnings growth, fundamentally sound profitability, attractive valuation and technical momentum. On this basis, we continue to see plenty of attractive opportunities in Europe across each of these four areas. Analyst consensus still expects 8% EPS growth for 2018 and 2019 in Europe. Return on equity continues to improve with several drivers playing their part – revenue growth, margin expansion, financial deleveraging/share buybacks and some tax cuts. As some parts of the world are already seeing margins peak, this would indicate that Europe’s current business cycle still has room to run. Our experience on the ground shows that Europe’s earnings recovery is still very much under way. Earnings results so far in 2018 have generally seen companies report in-line or above consensus sales expectations – although the consumer staples sector was a notable disappointing outlier. More broadly, the 4Factor earnings signal for the defensive sectors in Europe is close to a ten-year low, with more positive signals from the cyclical sectors such as financials and resources. Despite some recent moderation, our GDP-weighted composite indicator of European economic data remains in positive territory i.e. indicative of expansion. 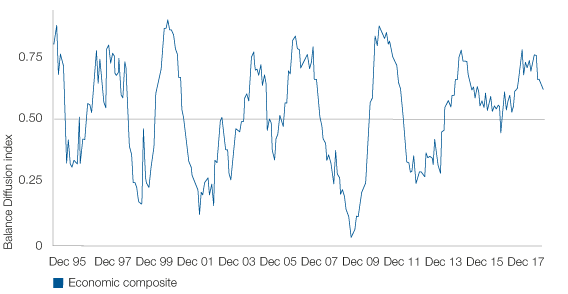 Sentiment around macro data points has weakened from higher levels, but this does not indicate contraction. Our belief is that Europe’s monetary policy will deliver a similar situation to the US, where the pace of recovery has been more gradual over a longer period of time than previous cycles. As we are less than two years into the most recent uptrend – compared with over four years for the US – we believe there is room for European corporate revenues to recover further. Source: Investec Asset Management, June 2018. The key risks are around global geopolitics. The Brexit negotiations continue to drive uncertainty for UK businesses and individuals – an environment that has led to weaker consumer spending in the past six months. But the cloud of uncertainty hasn’t stopped UK companies from investing for growth. Indeed, we are seeing strong UK M&A activity year to date: for example Shire, Sainsbury’s and Virgin “Our experience on the ground shows that Europe’s earnings recovery is still very much under way.” THE CASE FOR EUROPEAN EQUITIES Money. The pace of deals is such that the US$120 billion of deals struck in the first quarter of 2018 represent the largest tally in 11 years. The ongoing talk of a global trade war also loomed large over the market, especially in the commodities sector. 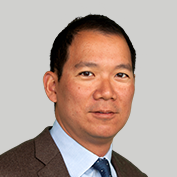 However, as bottom-up stock-pickers, we will approach this on a company-by-company basis. This holds true for both the direct impact of the trade tensions, as well as indirect effects, such as decreases in commodity or metal prices if tariffs tilt supplies towards Europe. Our process is also showing positive improvements on the strategy front, where we focus in on companies that can generate shareholder wealth above and beyond the cost of invested capital. As it currently stands, European companies have been delivering improving returns on equity, due in part to the improving revenue trends and the resulting operational leverage. All the while, improved capital discipline and cost cutting exercises undertaken during the previous earnings downturn are also starting to bear fruit. Although our assessment of Strategy (aka quality) for European companies is improving in aggregate, it’s worth noting that not all sectors are at the same stage of the recovery. 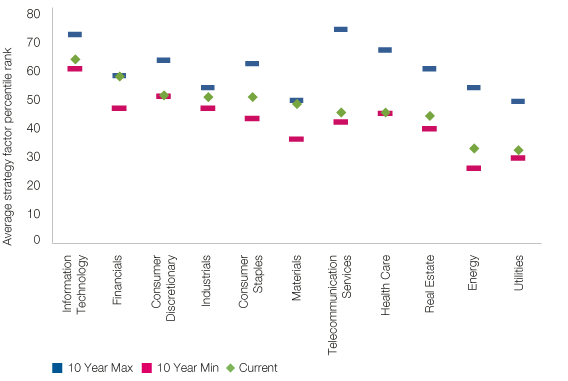 Currently our process views the financials and materials sectors as being at ten-year highs with regards to Strategy, while a number of sectors are challenging their ten-year lows. This divergence can create opportunities for us as bottom-up investors. Source: Investec Asset Management , June 2018. The materials sector is benefiting from higher commodities prices, as well as a newfound capital discipline that has seen the sector’s leading operators rethink their “growth at all cost” mind-set to focus towards investing in high-returning assets and increasing shareholder payouts. Meanwhile in financials – more specifically banks – we currently see good opportunities to invest in a sector that is starting to recover from a decade of structural regulatory and “European companies have been delivering improving returns on equity ” THE CASE FOR EUROPEAN EQUITIES economic headwinds. With the uncertainty around Basel IV regulation now resolved, banks have the possibility to use the excess capital sitting on their balance sheets to lend, creating additional revenues that can further fuel returns. Though we do not expect any ‘boom’ in lending, there are reasons to believe that we are still early in the lending cycle: corporate balance sheets are at their strongest for 10 years; household indebtedness is improving; M&A levels are recovering and private equity firms are starting to invest again. Another part of the market worth mentioning for its recent Strategy improvement is UK food retail. After years of rampant growth, the sector is now starting to allocate capital more wisely after management at the leading UK grocers halved their investment in new space. Additionally, we are seeing better use of existing footprints through the addition of concessions and scaling up to improve buying power – both of which are starting to reflect positively on margins. We have been waiting 10 years for such opportunities in this sector! Less positively in strategy, we’re currently seeing some weakness in telecoms, healthcare and retail, which are all at the low end of their historical profitability ranges. The challenge here is isolating which sectors have structural headwinds to returns – such as retail and automobile components – and those which might contain interesting stock-specific opportunities. One example of a latter case is the media sector, where the agencies are under pressure while their free-to-air TV broadcast peers are benefitting from a cyclical demand tailwind. We are also conscious that we can’t rely purely on history; and therefore hold two online businesses that benefit from structural changes in consumer behaviour. As ever with equities, positive earnings momentum and solid profitability don’t necessarily guarantee returns as this often increases the risk of overpaying. Although we have seen European equities trade more richly over the last 18 months, European equities do not look overvalued. On a through-cycle earnings basis, the cyclicallyadjusted P/E for Europe is 7% below its long term average. This is a very different situation to the US market, where equities now trade at near their historical highs on this metric – although we do note that a part of this premium has been driven by the recent tax reforms and the impact of highly valued “FANG” tech giants on index valuations. Source: UBS European Equity Strategy, April 2018. This conclusion – that the European market is on a discount to its long-term valuation - holds on a variety of other valuation approaches, including dividend yield. It also holds true on relative valuation metrics, such as the equity risk premium being priced into equities over regional benchmark bond yields. We also see encouraging signals on the technical momentum front, the final piece of our 4Factor screen. Here we see steers into Europe that are marginally ahead of the global pack due to the relatively early stage of the upswing in European equities. 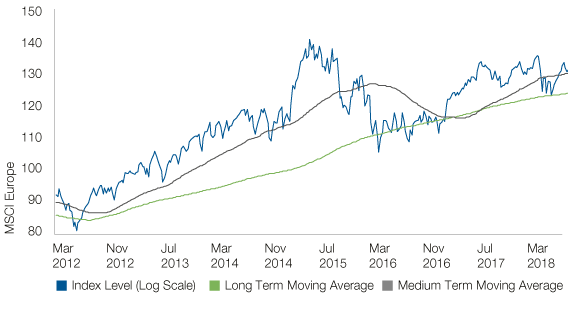 Indeed medium-term European equity prices have traded above their long term trend line for a year, while the US rally has been ongoing for over seven years. This factor will always be the most volatile, however, current indications do not give us any reasons to worry about market timing at this stage. In summary, we continue to be constructive on European equities due to our investment thesis: that earnings and returns are benefiting from the economic recovery and the recent round of self-help measures undertaken by companies. Meanwhile, valuations do not reflect the full extent of the earnings recovery. Downside risks are common to equities, but we remain focused on the upside potential, especially if European banks are able to show lending growth. This communication is for institutional investors and financial advisors only. It is not to be distributed to the public or within a country where such distribution would be contrary to applicable law or regulations. If you are a retail investor and receive it as part of a general circulation, please contact us at www.investecassetmanagement.com/contactus. Nothing herein should be construed as an offer to enter into any contract, investment advice, a recommendation of any kind, a solicitation of clients, or an offer to invest in any particular fund, product, investment vehicle or derivative. The information may discuss general market activity or industry trends and is not intended to be relied upon as a forecast, research or investment advice. The economic and market views presented herein reflect Investec Asset Management’s (‘Investec’) judgment as at the date shown and are subject to change without notice. There is no guarantee that views and opinions expressed will be correct, and Investec’s intentions to buy or sell particular securities in the future may change. The investment views, analysis and market opinions expressed may not reflect those of Investec as a whole, and different views may be expressed based on different investment objectives. Investec has prepared this communication based on internally developed data, public and third party sources. Although we believe the information obtained from public and third party sources to be reliable, we have not independently verified it, and we cannot guarantee its accuracy or completeness. Investec’s internal data may not be audited. Investment involves risks. Past performance is not indicative of future performance. Any decision to invest in strategies described herein should be made after reviewing the offering document and conducting such investigation as an investor deems necessary and consulting its own legal, accounting and tax advisors in order to make an independent determination of suitability and consequences of such an investment. This material does not purport to be a complete summary of all the risks associated with this Strategy. A description of risks associated with this Strategy can be found in the offering or other disclosure document for the Strategy. Copies of such documents are available free of charge upon request. Investec does not provide legal or tax advice. Prospective investors should consult their tax advisors before making tax-related investment decisions. In the US, this communication should only be read by institutional investors, professional financial advisers and their eligible clients, but must not be distributed to US persons apart from the aforementioned recipients. In Australia, this document is provided for general information only to wholesale clients (as defined in the Corporations Act 2001). In Hong Kong, this document is intended solely for the use of the person to whom it has been delivered and is not to be reproduced or distributed to any other persons; this document shall be delivered to professional financial advisors and institutional and professional investors only. It is issued by Investec Asset Management Hong Kong Limited and has not been reviewed by the Securities and Futures Commission of Hong Kong (SFC). The Company’s website has not been reviewed by the SFC and may contain information with respect to non-SFC authorised funds which are not available to the public of Hong Kong. In Singapore, this document is issued by Investec Asset Management Singapore Pte Limited (company registration number: 201220398M) for accredited investors, professional financial advisors and institutional investors only. In Indonesia, Thailand, The Philippines, Brunei, Malaysia and Vietnam this document is provided in a private and confidential manner to institutional investors only. In South Africa, Investec Asset Management (Pty) Ltd. is an authorised financial services provider. Investec Asset Management Botswana, Unit 5, Plot 64511, Fairgrounds, Gaborone, Botswana, is regulated by the Non-Bank Financial Institutions Regulatory Authority. In Namibia, Investec Asset Management Namibia (Pty) Ltd is regulated by the Namibia Financial Institutions Supervisory Authority. Except as otherwise authorised, this information may not be shown, copied, transmitted, or otherwise given to any third party without Investec’s prior written consent. © 2018 Investec Asset Management. All rights reserved. Issued by Investec Asset Management, June, 2018. Additional information on our investment strategies can be provided on request. Indices Indices are shown for illustrative purposes only, are unmanaged and do not take into account market conditions or the costs associated with investing. Further, the manager’s strategy may deploy investment techniques and instruments not used to generate Index performance. For this reason, the performance of the manager and the Indices are not directly comparable. If applicable MSCI data is sourced from MSCI Inc. MSCI makes no express or implied warranties or representations and shall have no liability whatsoever with respect to any MSCI data contained herein. The MSCI data may not be further redistributed or used as a basis for other indices or any securities or financial products. This report is not approved, endorsed, reviewed or produced by MSCI. None of the MSCI data is intended to constitute investment advice or a recommendation to make (or refrain from making) any kind of investment decision and may not be relied on as such.